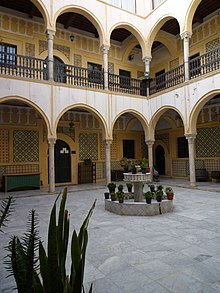 The Karamanly House Museum (also known as the Qaramanli House Museum, the House of Karamanly and the Tripoli Historical Exhibition) is a historic house and museum located in Tripoli, Libya. It is associated with the Karamanli dynasty. The house was built in the second half of the 18th century. After restoration in the 1990s, it became a museum. ^ a b "Karamanly (Qaramanli) House Museum". Temehu Tourism Services. This article about a museum in Libya is a stub. You can help Wikipedia by expanding it. This page was last edited on 3 May 2018, at 11:23 (UTC).